Natural source marine oil with omega-3 & collagen.Seven Seas Perfect7 Prime: You may take action to combat the signs of ageing on the outside, but do you do enough against the signs of ageing from the inside to help stay looking and feeling youthful? 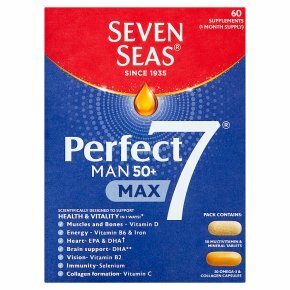 Our experts have boosted the ingredients and benefits of Perfect7 Man and developed those into Perfect7 Prime so you can continue to enjoy life to the full in your prime years. Perfect7 Prime contains a boost of Omega-3 plus Collagen, with copper which contributes to the maintenance of normal connective tissues. Specifically tailored to support* *Perfect7 Prime Man has been specifically designed to support: 1 Muscles and Bones: Vitamin D contributes to the maintenance of normal muscle function and bones 2 Energy: Vitamin B6 and Iron contribute to the reduction of tiredness and fatigue 3 Heart: EPA & DHA contribute to normal function of the heart 4 Brain Support: DHA contributes to normal brain function** 5 Vision: Vitamin B2 contributes to maintenance of normal vision 6 Immunity: Selenium contributes to the normal function of the immune system 7 Collagen formation: Vitamin C contributes to normal collagen formation for the normal function of bones and cartilage **The beneficial effect for brain function is obtained with a daily intake of 250 mg of DHA The beneficial effect for the heart is obtained with a daily intake of 250 mg DHA/EPA. Dosage: Take one tablet (Blue blister) and one capsule (Silver blister) a day with a cold drink. Do not exceed the recommended dose. Food supplements should not be used as a substitute for a varied diet and a healthy lifestyle.<br><br>KEEP OUT OF REACH OF YOUNG CHILDREN. THIS PRODUCT CONTAINS IRON WHICH CAN BE HARMFUL TO YOUNG CHILDREN IF CONSUMED IN EXCESS.